As we look ahead at the future of Downtown Venice, it is important to remember our past. In 1987, the Downtown Venice Association, a merchant’s organization, formed a non-profit corporation, Venice Main Street Association, enabling them to apply for the Florida Main Street Program. Venice City Council committed to contributing $15,000 per year in support for three years if Venice was accepted into the Florida Main Street program. In March 1988, Venice was chosen as a Florida Main Street City and selected its first Main Street manager. 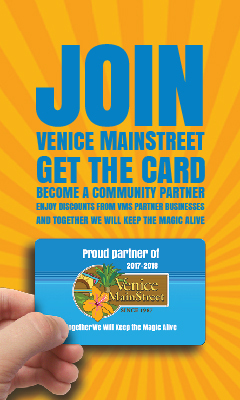 Today Venice MainStreet celebrates 32 years as an accredited Main Street program. Florida Main Street is an assistance program administered by the Bureau of Historic Preservation, Division of Historical Resources, and Florida Department of State focusing on traditional historic commercial corridors. The Bureau conducts statewide programs aimed at identifying, evaluating and preserving Florida’s historic resources. Main Street, with its emphasis on preservation, has proven to be an effective strategy in achieving these goals in Florida’s historic retail districts. In the past, the word “downtown” brought to mind an image of a bustling center of commerce and activity. Too often, however, many small Florida downtown districts provided images of vacant, deteriorating buildings and struggling businesses. Communities have now discovered that with help from Florida Main Street, downtowns can thrive again. Venice MainStreet strives to develop and maintain strong relationships with its Business and Community Partners. Downtown Venice is testimony to the success of these relationships and the importance of common goals.